The Forex and CFD broker IG Markets is operated by the well-known IG Group Limited and is one of the most famous and the world’s largest providers. In addition to the main company headquarters in the English capital London, the company also operates a branch office in Germany. In combination with German language support, IG Markets is of course particularly interesting for German traders. To ensure security, the traders do not need to worry, because the broker is subject to a very strict regulation by two well-known institutions. At IG Markets, customers benefit from a very wide selection of different retail products. There are over 80 currency pairs and more than 7,000 CFDs on stocks, commodities, indices, ETFs and options. In addition to this large selection, the Forex and CFD broker is proud of its professional trading platform. In general, the online offer is aimed at both professional traders and beginners. The Forex and CFD broker was established in 1973 and is thus one of the oldest providers. IG Markets has been listed on the DÃ¼sseldorf Stock Exchange since 2006. Traders can trade via this broker both with currency pairs and with differential contracts. Since the middle of 2015, IG Markets has also been offering trading in classic stocks. While the German branch office is located in DÃ¼sseldorf and the company headquarters in London, the company still has numerous additional offices in 15 other countries. IG Group Limited, which operates worldwide, employs more than 1,000 people and serves more than 150,000 customers. The Forex and CFD broker is strictly regulated and is subject to strict supervision by the British FCA as well as the very strict supervision by the German BaFin. IG Markets meets many strict requirements. Among other things, customer deposits are kept separate from the rest of the company’s assets. This means that potential customers must never worry about the security or credibility of this broker. In terms of trading opportunities, IG Markets is undoubtedly one of the providers with the largest selection. Forex traders can invest in more than 80 different currency pairs at IG Markets. Among them are all majors and of course also a few exotics. With the main currency pairs, the spreads begin with only one pip. Normal spreads range from 2 to a maximum of 4 pips . Overall, the wide selection leaves nothing to be desired and should satisfy any preference. In the area of the differential contracts, the selection is even larger. CFD traders benefit from more than 10,000 financial instruments from various stock exchanges around the world. They can, among other things, deal with commodities, equities, bonds and foreign exchange. The selection of stocks is very large and should satisfy any taste without any problems. The differential contacts can be concluded for more than 8,000 different shares. These include the papers of all major American, European, Australian, Canadian and Asian indices. Index CFDs can be traded through IG Markets around the clock and on more than 5 and 20 markets worldwide. In addition to the low spreads, the security deposits to be deposited by IG Markets are also convincing. If the traders deal with currencies, the security performance is only 0.5 per cent of the respective value of the position. This results in a maximum lever ratio of 1 to 200. When trading with CFDs, the losses can, of course, also exceed the safety performance. To ensure that traders do not have to raise capital, you should think in advance of appropriate risk management. IG Markets offers its customers the option to set up stops and thus safeguard against the risks. In addition, the Forex and CFD broker provides their customers with two different charts. The Quickcharts are ideal for inexperienced traders, while the Procharts are especially suitable for professional traders. All traders receive direct and free access to some chart-based and automated identification and filter programs. These include, among others, the Autochartist, a very powerful pattern recognition software that identifies and interprets course formations in real time and monitors all asset classes. CFD and Forex traders can use the web-based trading platform PureDeal and trade through their browser. The trading platform leaves a professional and clear impression and is easy to use. In addition to simple trading, traders can also receive analysis and news about the platform. Traders who need an even more professional trading platform can use the L2 Dealer instead. This was developed especially for experienced traders and provides the dealers a direct market access. The software L2 Dealer provides its users with a wide range of trading tools and features, such as real-time news, order tracking and charts. 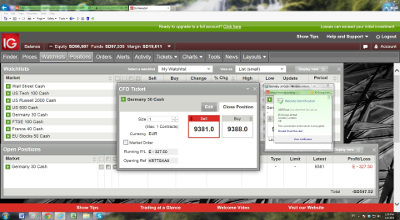 The world-famous MetaTrader 4 trading software can also be utilized by IQ Markets’ users. This trading platform is particularly suitable for experienced traders and offers a wide range of functions and possibilities. Customers from IG Markets, who prefer to trade from the road, are also getting their money’s worth. The Forex and CFD broker provides traders with free mobile trading platforms. These work not only on the iPhone and on Android smartphones, but also on Blackberrys and on Windows Phones. Alternatively, the mobile trading application can also be installed and used on a tablet. While on the road, traders have access to all important trading functions, such as price analysis and price optimization. Its own analytical center allows even the current market data and opinions from experts to be called up. Potential new customers who want to test IG Markets’ extensive trading offer and trading platforms can do so easily. The broker offers his customers a free demo account, which allows the traders to convince themselves at no cost and without risk of the broker’s trading offer. The demo account provides traders with 10,000 euros of virtual capital and can be used for a total of 14 days. Unlike most other brokers, IG Markets waives a minimum deposit. This allows traders to open their account without any problems and deposit any amount. The broker also does not use different account types. In addition to the free demo account, new customers can simply open a normal trading account. The opening is completed within a few minutes and free of charge. After entering the personal data, the new customers must provide information on their previous trading experience and agree to the declaration. While traders will have to make a deposit with most brokers to activate their account, they can still wait for IG Markets. Unfortunately, the payment methods offered are relatively straightforward. The broker offers his customers only deposits via credit card or by classic bank transfer. All currencies are accepted and the money has been credited to the trading account a few moments later via credit card. This is subject to a transaction fee of 1.5 percent. The two payment methods are also available to the customers for disbursements. Traders who opt for a payout via credit card must expect a processing time of 1 to 3 days. Whoever decides to pay out the current account must expect a relatively long processing time of 7 days. All these payouts are free of charge. Unfortunately, IG Markets waives a bonus for new users. The broker rewards his traders if they recommend IG Markets to a new user and their referral runs at least 5 threads in a period of 6 months, the advertiser receives a point. For 2 points, the traders will get a full 125 Euro on their trade account credited. Traders who reach 3 points receive even 200 euros. The premiums can be paid out directly and no special conditions have to be fulfilled. In addition, the broker also offers a variety of in-kind awards, such as books on trading strategies and current market techniques. Because the broker has a German branch, the traders even have a German-speaking support. Questions and problems can thus be clarified without language barriers. The German customer support is available to traders on weekdays during normal working hours available. At the weekend and at night, however, the traders will have to deal with the English customer service only. In general, all customers can contact the support around the clock. They will solve all questions and problems within a very short time. The easiest way to contact support is via the free hotline number. Alternatively, users can contact support via e-mail or live chat in real-time. In general, the staff is always friendly and hard-working. IG Markets is one of the oldest Forex and CFD brokers and enjoys a good reputation not without reason. It is definitely a safe and reputable provider and it is regulated and controlled by both the English and the German Financial Supervisory Authority. Traders can benefit from various trading platforms and can trade both at home and while on the road. Users have numerous trading tools and possibilities at their disposal. Thanks to the existing demo account, all functions can be tested without any financial risk. Traders who actively promote the broker to the new customers are rewarded. Unfortunately, there is no new customer bonus and also the selection of payment methods could be more diverse. The best features of IG Markets include the professional trading platforms, the huge selection of trading tools and customer support. One of the few disadvantages of IG Markets is the non-existent new customer bonus and the low selection of payment methods. Nevertheless, the advantages outweigh the disadvantages clearly and for this reason, the broker is definitely recommendable.